JOIN ZUMBA SANDRA GETTING FIT THE FUN WAY!!! ZUMBA is a Latin-inspired, dance- fitness class that incorporates Latin and International music and dance movements, which create a dynamic, exciting, and effective fitness system! This class format combines fast and slow rhymes that tone and sculpt the body in an aerobic/fitness fashion to achieve a unique blended balance of cardio and muscle-toning benefits. Dancers and non-dancers alike immediately and easily master a Zumba class because you do not have to know how to dance to succeed at Zumba. Zumba creates a party-like atmosphere that provides a non-intimidating opportunity for non-dancers, new exercisers, or those who have previously hesitated to participate in group classes. To visit the official Zumba Website click here! The fun and easy format makes it inevitable for participant to adhere to the Zumba program. So as participants keep coming back for the fun, they start to see their bodies begin to change, and they start to feel better about themselves. These positive results add to the reasons why Zumba classes are always full - students quickly learn that Zumba is fun, easy, effective and that anyone can do it. Zumba is indeed great for the mind, body and soul! 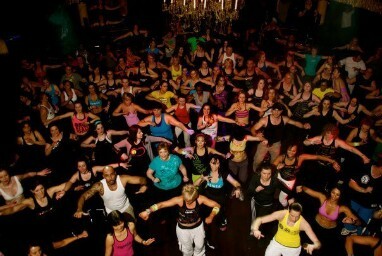 The Zumba program is the most effective, innovative, and exciting workout designed for everyone! It's fun! Zumba is "Exercise in Disguise". Participants are having so much fun. They do not realize they are exercising. Finally, here is a type of exercise people want to do everyday and they feel good about doing it! It's different! The music, the steps, the moves, the class , the feel.....all are like no other! It's easy! Zumba is designed for everyone. Participants of any fitness level, any background or any age can start to Zumba right away. Zumba's basic steps formula makes it easy for everyone.